BA Painting and MFA Fine Art graduate, Jasmir Creed, has a new solo exhibition opening at The Victoria Gallery & Museum in Liverpool, entitled ‘Dystopolis’. 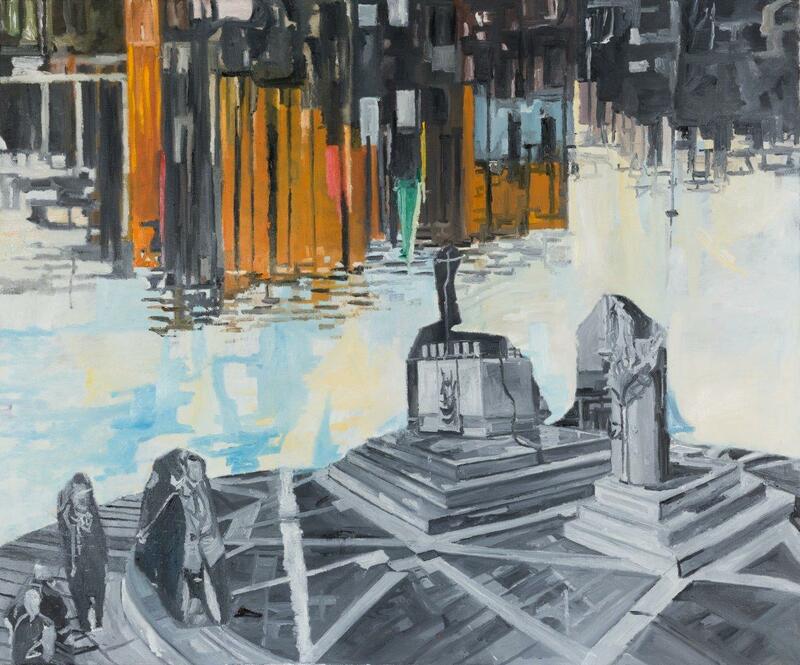 We spoke to Jasmir about how the exhibition came about, her sources of inspiration and her practice producing paintings, drawings and montages exploring the psycho-geography of cities. Can you tell us about your upcoming exhibition at The Victoria Gallery & Museum in Liverpool? My solo exhibition, which I successfully obtained Arts Council England funding for, is titled ‘Dystopolis’ and will run from 17 November 2018 – 21 April 2019. The private view will be on 16 November at 6pm. 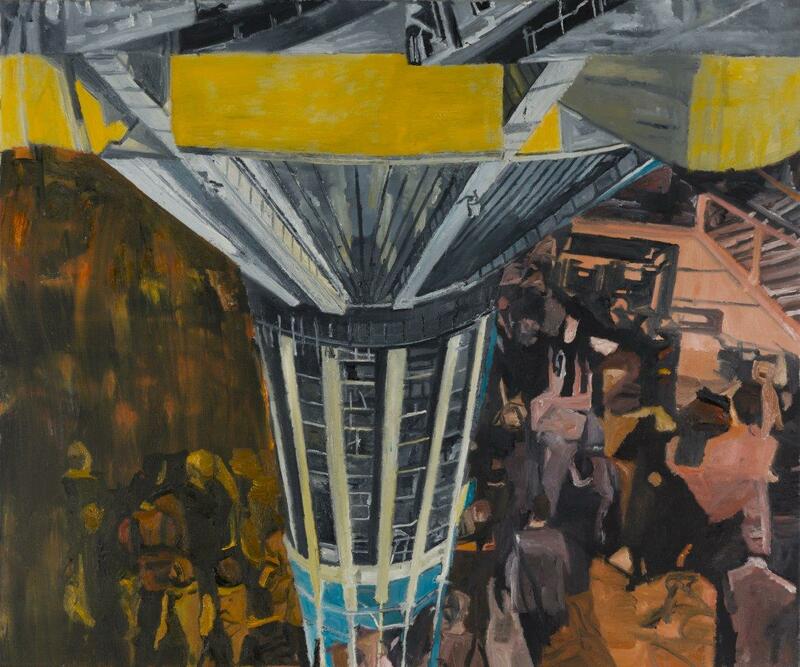 The title ‘Dystopolis’ refers to the unsettling architecture that I see as domineering, creating a dystopic sense of a metropolis, illustrating an atmosphere of alienation in the urban environment, as individuals confront crowds weaving through cities. I’m showing 15 large new paintings, curated by the Victoria Gallery and Museum curator Dr Amanda Draper. I met the Victoria Gallery and Museum team when I attended a study day there held by the Contemporary Art Society back in February this year. During a break I was invited to show some images of my work and the team were very intrigued. I was then offered a solo exhibition after I sent the curatorial team a proposal. An accompanying exhibition catalogue has critical texts by world-renowned writers Lauren Elkin and Dr. Graeme Gilloch (Lancaster University), as well as curator Amanda Draper. Liverpool University Press are going to disseminate the catalogue worldwide, with extensive publicity. 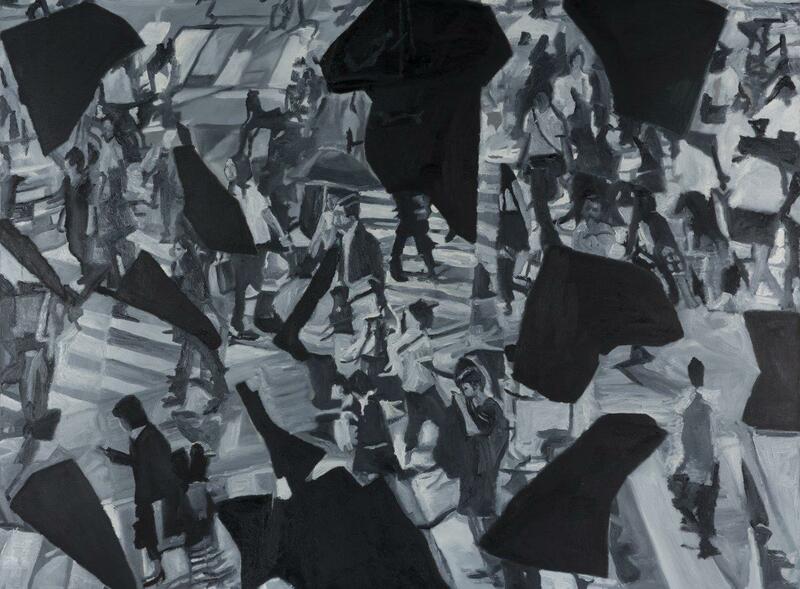 My paintings explore the psycho-geography of cities, especially Manchester and Liverpool, focussing on architecture and crowds based on my experiences journeying through cities. My images reflect how geographical locations affect emotions and behaviours e.g. tensions between the individual and collective corporate culture, as seen in people and city tower blocks. 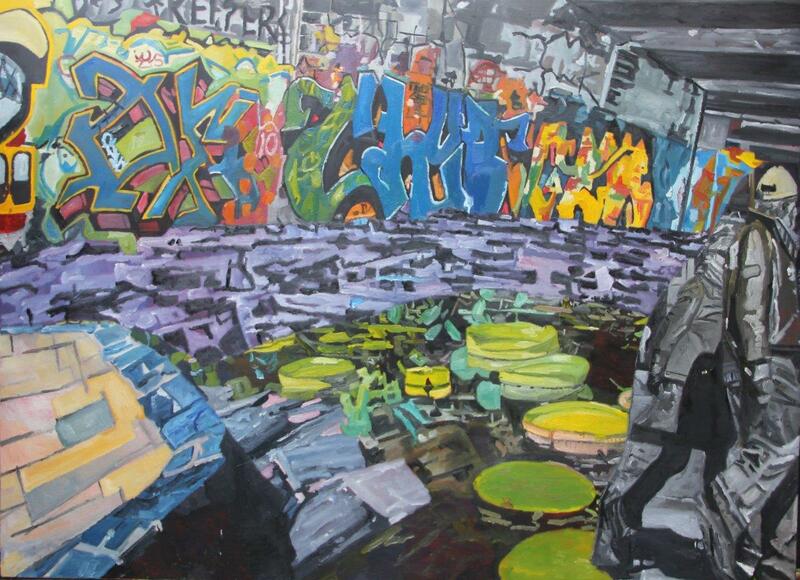 Images contrast multiple viewpoints expressing feelings of alienation and flux in the jostling movement of people in city spaces showing the city as a rich forest-like environment of the known and the unknown. The materiality of paint and colour filter and personalise experiences, creating dynamic shifts between light and dark, large and small, geometric and organic with exaggerated simplified forms. Rich monochromes, subtle colours and expressive mark making heighten a sense of disorientation. The use of chance in my work is an important factor in its production, based on experimentation with montage using photographs of different environments that I take. My montages are hand made with printed material rather than using digital processes, and create surrealistic juxtapositions forming visual dialogues to create a sense of strangeness about otherwise familiar everyday scenes. The use of physical materials enables processing of multiple images into a personal distillation. How has your practice changed and developed since graduating from Wimbledon? My practice is always evolving and changing. A new strand in my work which I will start to develop is how people experience the city in the contemporary digital age. Charles Baudelaire identified the flâneur as a stroller and observer in his essay The Painter of Modern Life (1863). The flâneur and urban explorer in the 19th century was usually a wealthy man of leisure whereas I am a female urban wanderer, honing my images to reflect my responses to contemporary cities, engaging physically to locations, and also to my journeys in digital illusionary spaces. Do you have any artistic influences or particular sources of inspiration? I am fascinated by iconic buildings such as Imperial War Museum North in Manchester designed by Daniel Liebskind. I invigilate exhibitions there and notice the slow movement of visitors, families and war veterans, reacting to images in the exhibits. Other influences include work by contemporary Ethiopian artist Julie Mehretu who explores abstracted images of cities, histories, wars and geographies with a frenetic mark making that for the artist becomes a way of an unravelling a personal biography, similar to my use of topological maps in my painting. Andreas Gursky’s photographs of crowds, including of the Tokyo stock exchange, show an aerial view similar to the viewpoint in my painting Fragmentation (2017). What else have you been up to since graduating from Wimbledon? After graduation I moved back up to Manchester where I am from originally. I have been artist in residence at Paper Gallery in Manchester and Castlefield Gallery Manchester New Art Spaces in 2016. Recent exhibitions include an Arts Council England funded solo exhibition ‘Urban Forest’ at Delta House Studios in London in 2017; Lynn Painter Stainers Prize at Mall Galleries in London 2017; CGP Open in London 2016; We all Draw at the Bargehouse Oxo Tower in 2015 curated by Tania Kovats and Kelly Chorpening. I am a visiting lecturer at universities including UAL and am involved in delivering museum and gallery education workshops, including a study day on the Francesca Woodman and Egon Schiele exhibition at Tate Liverpool in September this year. I had a painting commissioned by Imperial War Museum North in 2017 which is on permanent display there. I was also recently exhibiting in the Manchester Contemporary Fair on the Asia Triennial Manchester Stand in October this year. What did you enjoy the most about both the BA Painting and MFA Fine Art courses at Wimbledon? I loved having the use of relaxing studio spaces with tranquil leafy surroundings, and the technical support and access to library facilities were very beneficial. I often find myself reflecting on how my work and critical knowledge has changed and developed throughout my five years of studying on the BA Painting and the MFA Fine Art courses. What else is next for you in your career? My production of new work (paintings and drawings) will develop my professional practice including though public display and engagement with audiences including artists, curators, collectors and writers. I hope to achieve further exhibitions of my work in the UK and internationally. Dystopolis is taking place at the Victoria Gallery and Museum, Liverpool from 17 November 2018 – 21 April 2019. You can buy the exhibition catalogue from Liverpool University Press here. You can find out more about Jasmir and her work by visiting her website and following her on Instagram and Twitter.